now that we have a 2 and an H-2, it may be time to re-evaluate things. Interesting, maybe this will finally convince those wacky Texans at the TXDOT to stop calling their Interstates as "IH" and just use the plain ol' "I" like the rest of the Continental US. You just don't understand Texans. We don't do anything everybody else does. That is sometimes a good thing, and sometimes a bad thing. Non-Texan: "Hey, some guy from Austin said something about all Texans"
Non-Austin Texan: "Whatever he said, he's wrong"
Does I-2 overlap U.S. 83? I'm having trouble finding it on a map. IT IS THEREFORE ORDERED by the commission that ... I-2 ... be so designated on the state highway system concurrent with the existing route numbers. It does. It is the same east-west valley freeway that has been there since the 80s. Just resigned. So we can expect to see this on the 2015 Rand McNally road atlas? No, but it'll be on the limited-edition toilet paper. What better way to commemorate I-"2"? I guess "I-2 is cool"? signwise - only until 1969.
after that, you guys started worshipping the federal standards, complete with garish '70 spec shields... and then even decided to adopt Clearview. not very different at all. I cringe every time I see those old shields. what's wrong with them? I actually think they look great. I'm digging the expressway and business route banners, hating the udderly useless center sign, not much opinion one way or the other on the arrows in the shields. Oh I don't like the arrows on the shields. It's a weird problem I have since Texas until this year was the only state that didn't put the exit number on the gore sign and instead put it as a separate tab; it somehow reminds me of that and looks a little lazy to me, IMO. And that's not all. I can think of plenty of things Texans do that everybody else does: urinate, fornicate, procrastinate, masticate, etc. I hate to get back on topic, ha, but I personally would like to see Bussiness Route 83 decommissioned and US 83 rerouted on Bussiness 83. I cannot stand long concurencies and seeing how all of Interstate 2 will be concurent with US 83, this really chaps my hide. I think eventually (especially if Interstate 2 gets extended to Laredo) US 83 will be truncated, but for now, US 83 should be the local route and Interstate 2 should be the express route. I think there's an AASHTO rule that you an't move a US route from a freeway to a local road. Of course, as with all AASHTO rules, they are made to be broken (US 377! ), right!? In all seriousness though, didn't NCDOT successfully move US 117 back to its original route after I-795 was designated? Ohio once had US-40 routed on I-70 just to get people to use the freeway, and then they moved it back. I don't recall them getting a special waiver above and beyond the standard AASHO procedures. 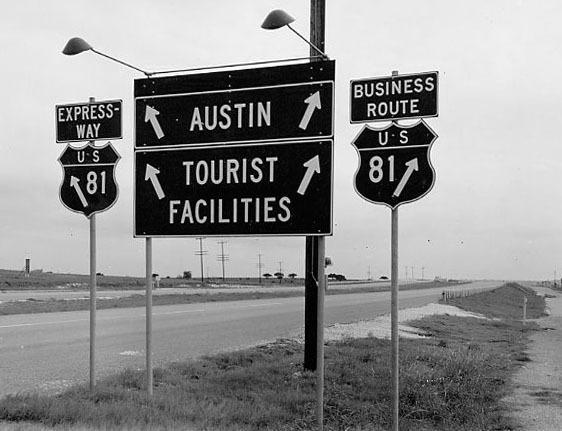 But in Texas, bannered routes are state highways. So it isn't a local road per se. I agree. I don't know why AASHTO has such a rule, because it makes a lot more sense to do this as opposed to keeping the US Route merged onto the Interstate, where it might (generally inadvertently) go hidden. so awesome. wonder where this is? Stupid. I refuse! And in Austin I see both. Texas is far from the only state to do that. Iowa until very recently, also put the number on a separate tab on top of the sign.